Tatsunoko vs. Capcom: Cross Generation of Heroes is a 2.5D Fighting game, developed by Eighting and published by Capcom, which was released in Japan in 2008. 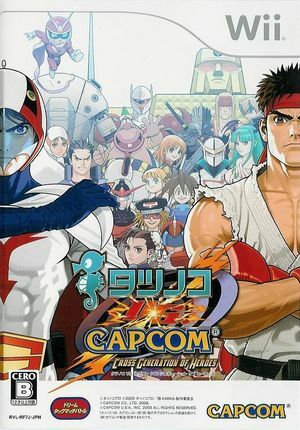 This game was the basis to Tatsunoko vs. Capcom: Ultimate All-Stars released in 2010 but both games are different. Tatsunoko vs. Capcom: Cross Generation of Heroes is capable of using both GameCube controllers and Wii Remotes. If a physical controller is set to emulate both a GameCube Controller and a Wii Remote concurrently, it will operate both devices at the same time. To fix, migrate controls to use separate physical controllers. Tatsunoko vs. Capcom: Cross Generation of Heroes is one of the most susceptible titles to shader compilation stuttering. The GC and Wii have no concept of shaders - everything is executed directly by the hardware without an intermediate programming language (API). Modern computers and mobile systems do not work in this way, requiring the use of shaders as an intermediary so your system's GPU can perform the tasks that the GC and Wii GPU performed directly. Shaders have to be generated though, and since GC/Wii games are not designed to create shaders ahead of time as a PC game would, when a new effect appears Dolphin has to delay the CPU thread while the GPU thread performs the compilation; a pause that does not exist on the consoles. For most games shader generation takes only a few milliseconds, but for a few demanding titles, the shaders that they generate are so large that they can result in noticeable stuttering, in severe cases pauses of over a second may occur. The graph below charts the compatibility with Tatsunoko vs. Capcom: Cross Generation of Heroes since Dolphin's 2.0 release, listing revisions only where a compatibility change occurred.